Welcome to Cuddles & Care Pet Sitting! Our goal is to provide loving, personal care to your pets when you can't be there. Whether you have a new puppy, are working long hours, traveling for business, are going on vacation, or are taking a weekend getaway, Cuddles & Care provides services designed to make life easier for both you and your pets. 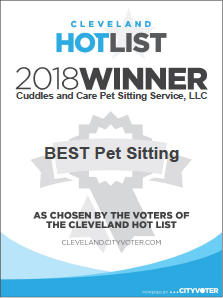 Voters named Cuddles & Care Pet Sitting Service, LLC the Best Pet Sitting in the Cleveland area for 2018. To determine the winner, voters had more than 20 nominees to choose from.